Leinster boss Michael Cheika is determined to keep his players focused ahead of their Heineken Cup showdown with Leicester at Murrayfield. The Irish province face double-chasing Leicester at Murrayfield in their first visit to the competition's showpiece event. Confidence is soaring following their 25-6 rout of favourites and defending champions Munster in the semi-finals and bookmakers are unable to separate tomorrow's rivals. "We are not short of confidence and we have to make sure we don't get carried away with the moment, that we simply concentrate on the job to be done. We just have to be composed and focused about everything we do this week. "And as we have not been in a final before we have to make sure we don't get too hyped up and realise that the battle is still there to be fought." In contrast to Leinster's lack of exposure to European finals, Leicester will be contesting their fifth. The Tigers remain the only club to defend their Heineken Cup crown, beating Stade Francais and Munster in 2001 and 2002, and have already lifted one trophy this season. Yet they failed to impress in beating London Irish 10-9 to claim the Guinness Premiership title last Saturday and Leinster will have seen the chinks in their armour. Cheika is quick to acclaim Leicester's European pedigree but hopes his side have saved their best till last. "Leicester are the team who could easily be called the cup kings of Europe," he said. "They have won the tournament twice and are now through to their fifth Heineken Cup final so they certainly know just what to expect on the day. "What we have to do is make sure we prepare in every way to achieve our goal. While we were delighted with the huge performances in the quarters against Harlequins and then Munster, we still hope we can produce our best game of the lot in the final." 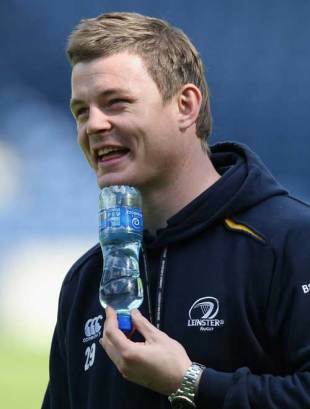 For all Cheika's eagerness to cast Leinster as underdogs, his side is hardly short of world-class players. Brian O'Driscoll, Luke Fitzgerald, Jamie Heaslip and Rob Kearney will join up with the Lions after the final and their squad contains five of Ireland's Grand Slam winners.